Following directions from Greg, I found dozens of these in pinion-juniper habitat around 7,800 ft elevation. However, the site was a long distance from our headquarters in Salt Lake City, and it seemed doubtful we could find enough plants with good seed, and we did not return in 2007 to attempt a collection. While at the Polygala subspinosa site, I photographed several other species I had never noticed before, including this one. When I returned and consulted Greg, he explained that this species also happened to be on our list to collect. But, here I only saw about ten of these Abronia nana plants, far too few to try to collect seed from. Late May was peak bloom time for this species, and I regret I did not spend enough attention to take a better photo. At least I bothered to take this photo, and that May day remains the only time I’ve seen this species. Greg led us to this site, where he knew this other Abronia species occurred. Associated species here are 4-wing saltbush, shadescale, blackbrush, cliffrose, Opuntia sp., Gaillardia sp., Juniperus osteosperma, Tamarix ramosissima, Sarcobatus vermiculatus, Stanleya pinnata. When we investigated these Abronia fragrans flowers, we found the seeds lacked good kernels. It appeared this fairly extensive population was not producing any good seed during 2007. Since then, I have noticed this species growing along paved roads. 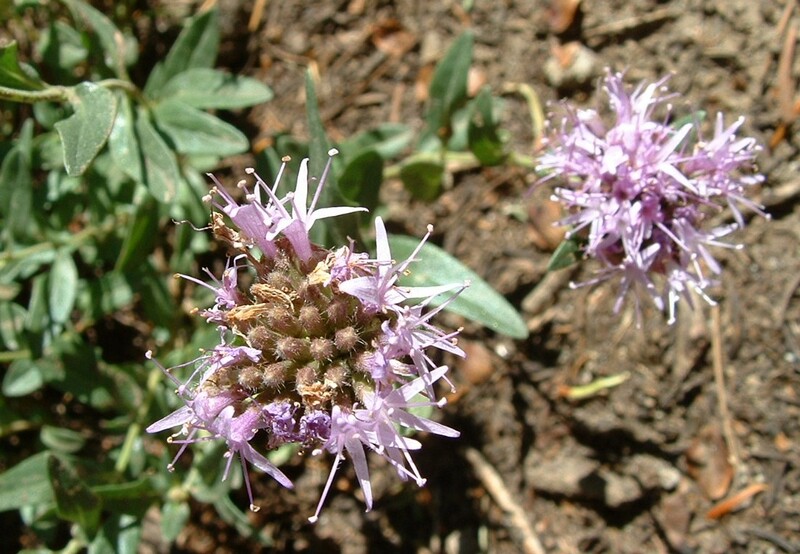 Not far off a dirt road in the Uinta Mtns, Greg and I found a few plants of this Phacelia species that was on our list. Here, around 8,600 ft elevation, with the predominant associated species Artemisia tridentata, Pinus contorta and Abies sp., we found 5 scattered Phacelia sericea plants, including this one. They were past peak bloom time, and all seemed to be producing good seed. 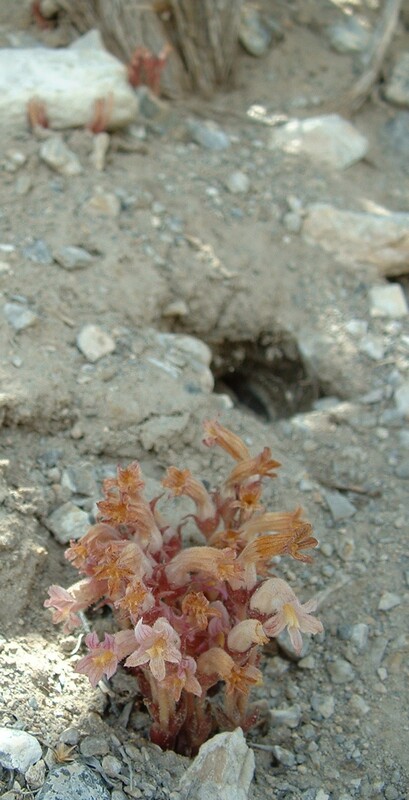 But 5 plants is too few to allow a proper SOS seed collection, and we failed to collect P. sericea in 2007. In the following season I returned to a different area nearby and found a few more plants. All of the ~10 P. sericea plants I have seen in the Uinta Mtns have grown where they were shaded part of the day by Pinus contorta or Abies sp. trees. 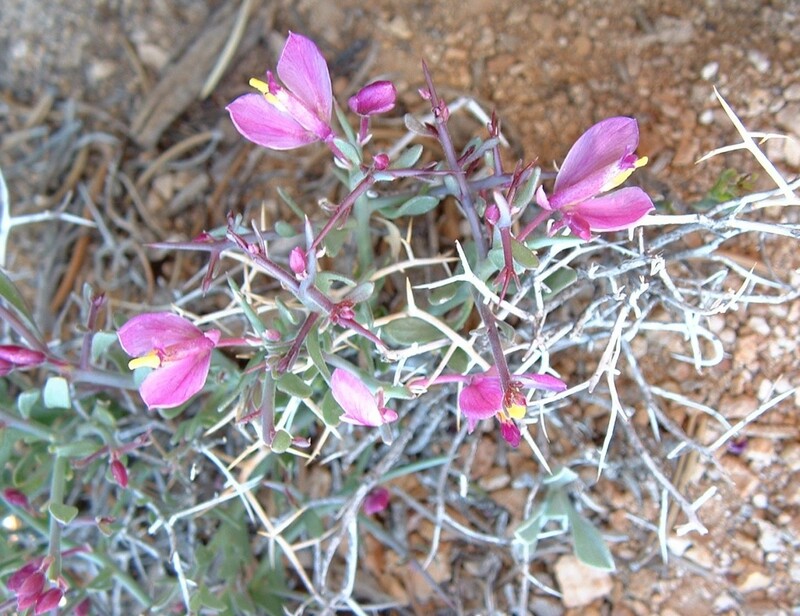 I was directed to 3 previously known sites for this species in the Wasatch Mtns. I also stumbled onto 3 more sites. However, 5 of these 6 sites had either no blooms, or very few blooms with no good seeds. This was one of those 5 sites. 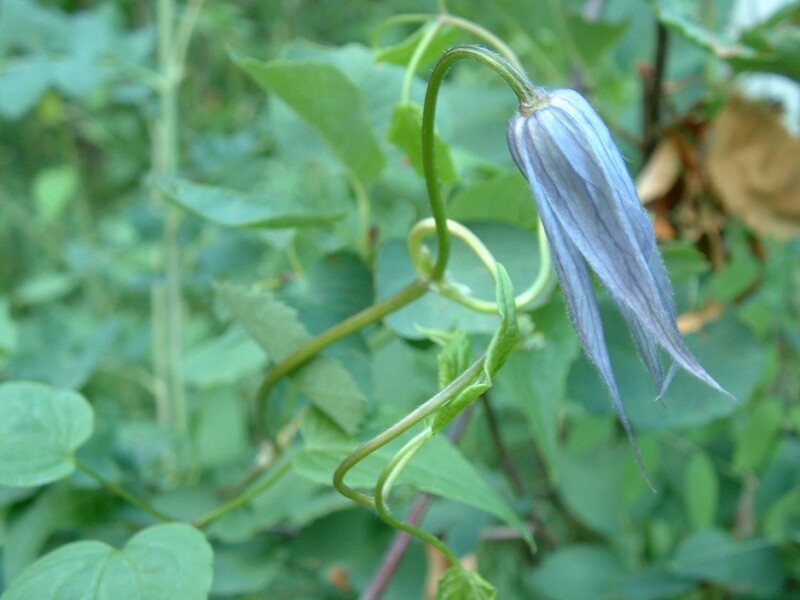 Here is a second photo of Clematis occidentalis, from a different site (in a different county) than the previous photo’s site. This was the only site of the 6 sites that seemed to be producing good seed. At least some of the old blooms that looked like this were producing mostly good seed. However, this immediate C. occidentalis population consisted of only 7 plants, on which I counted a total of only 22 flowers. So, this species remained uncollected by us in 2007. This site at which C. occidentalis produced at least some good seed was at lower elevation (~6,600 ft), and seemed to receive more sunlight, than the other 5 sites I investigated that apparently produced no good seed. Associated species at this site include Populus angustifolia, Populus tremuloides, Acer glabrum, Cornus sericea, Betula occidentalis, Lonicera involucrata, Rubus parviflorus, and Chamerion angustifolium ssp. circumvagum. I was able to count almost 280 plants in a population of this species, growing 10,000-10,400 ft elevation, among associated species Pinus flexilis, Juniperus communis, Zigadenus elegans, Ericameria discoidea and Oreochrysum parryi. However, when I made one visit in late July and my next visit 20 days later in mid August, I missed the best time to collect seed–which would have been the mid-point between those days. 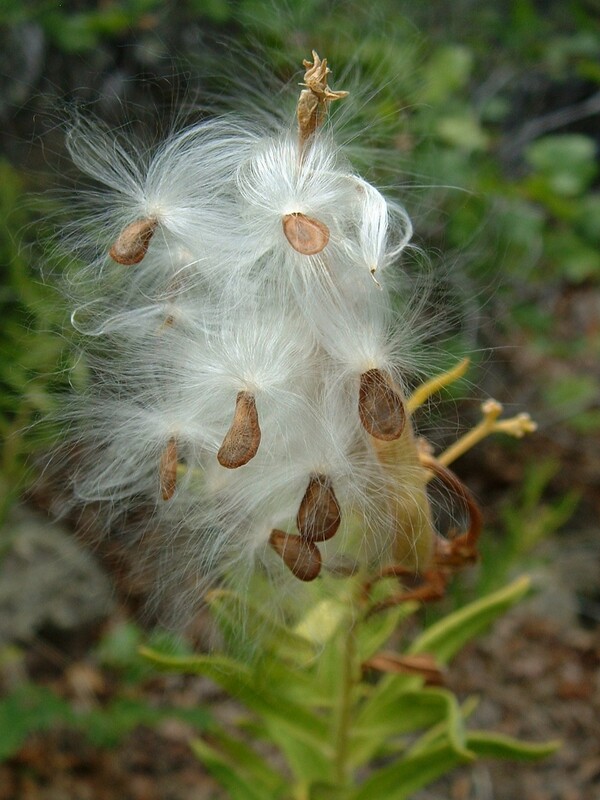 This high-elevation species would also be difficult because each seed pod matures rapidly–the time is quite short between when a pod seems too unripe and the time when that pod ripens enough to fall from the plant. It seemed as though rain helps almost all ripe pods to fall from their plants. So, there was no good collection of A. kentrophyta that we could gather in 2007. Still, I think that that site might produce a successful collection for SOS in some subsequent year. Here are some photos of 8 of the 16 species that we successfully collected and sent to Kew as part of the SOS project during 2007. During May – Sept 2007 I worked part-time as a fieldwork technician for a team in the conservation program at Red Butte Garden, a University of Utah-affiliated arboretum. With some funding channeled from the US government’s Bureau of Land Management, our small team participated in the BLM-sponsored Seeds Of Success project. We identified and vouchered likely populations, collected large seed collections when we were able, and shipped these to the Kew Millenium Seed Bank in England as part of the agreement between Kew and the BLM. Kew cleaned and analyzed each collection, kept half the seeds of each collection in their modern international seedbank facility, and shipped the other half back to a BLM seedbank repository in the US. Our work involved visits to the Utah Museum of Natural History’s Garrett Herbarium, to be certain of some species’ identifications. 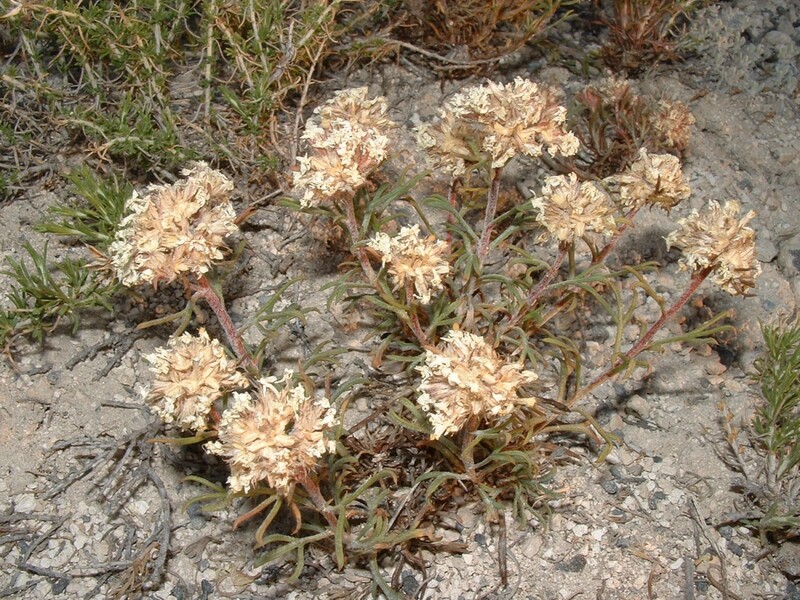 That work also introduced me to Welsh et al’s 2003 revision of A Utah Flora , which is not light reading. Our goal was to collect as many good seed collections of species in northern and central Utah that had not been collected before as part of the SOS project. That season we were able to collect and send to Kew 16 species’ collections–thanks to the expertise of my immediate supervisor Greg Maurer, and the direction provided by the conservation program’s director Rita Dodge, and the efforts of some volunteers who assisted with a few of the collections. Most of those 16 species Greg had in mind at the outset, based on his earlier visits to their habitats. 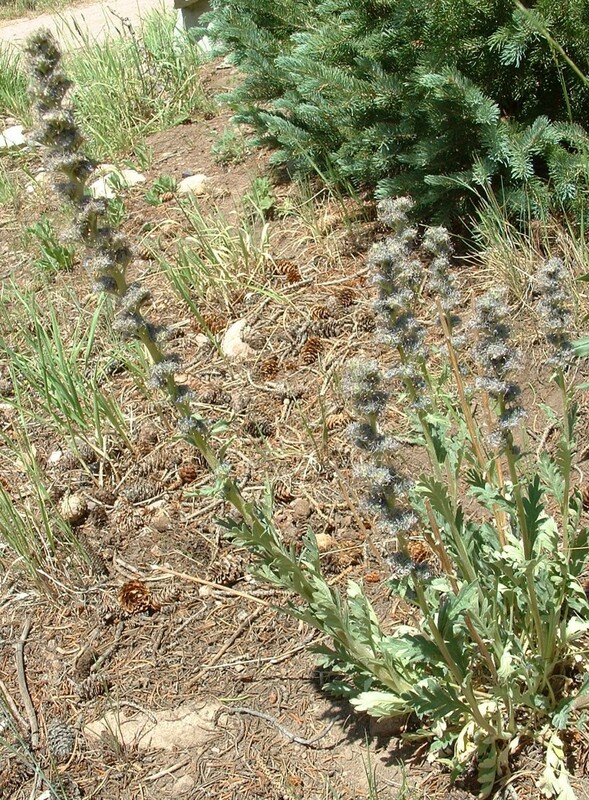 This grows around 5,300 ft elevation, among Artemisia nova, Tetradymia glabrata, Eriogonum ovalifolium, Atriplex confertifolia, Krascheninnikovia lanata, Cryptantha sp., cheatgrass, and scattered juniper. I collected seeds from this population by myself, across three evenings, working when it was cool after dark. With my headlamp in the dark there was the only time I’ve seen Jerusalem Crickets (Stenopelmatus fuscus) moving on the surface very quickly, something they apparently only do at night. 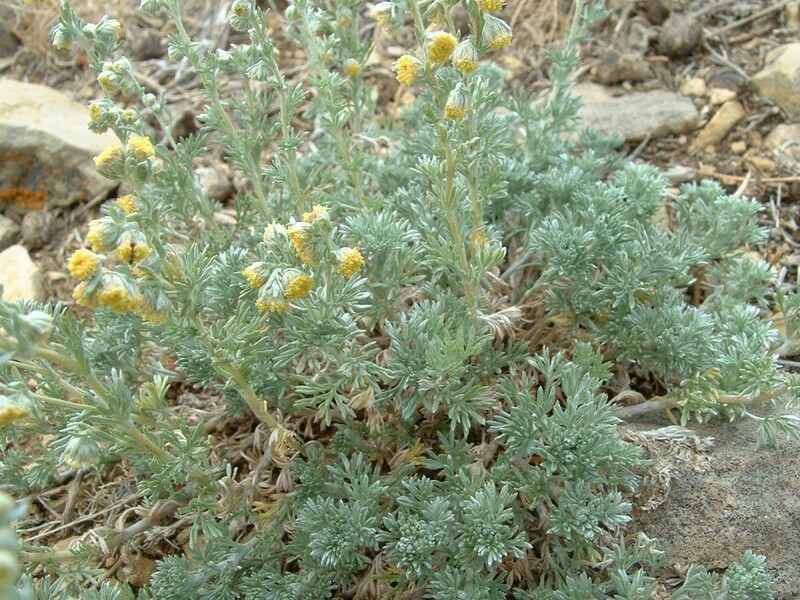 Here this grows around 4,900 ft elevation, among Artemisia nova, Artemisia tridentata, Ephedra nevadensis, Atriplex confertifolia, Halogeton glomeratus, Krascheninnikovia lanata, and Juniperus osteosperma. 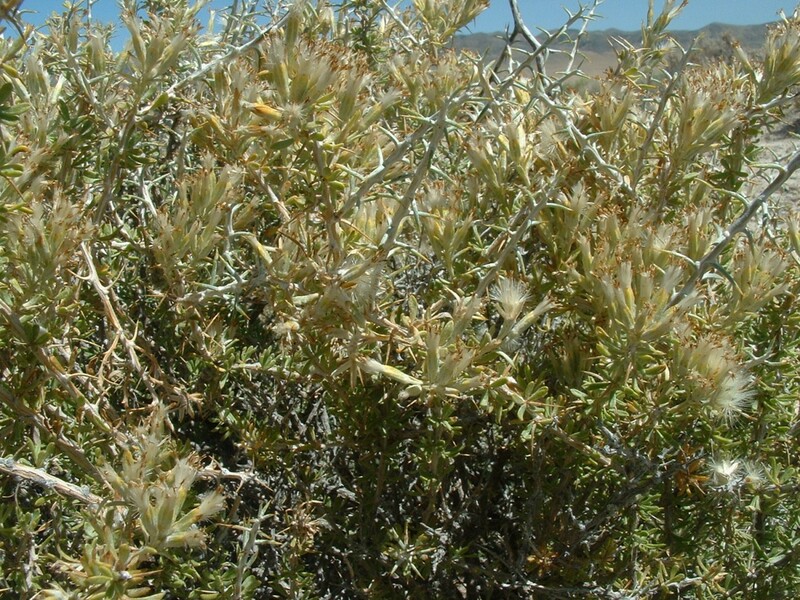 I found this species my first time one week earlier in the foothills of the House Range in Millard Co. That’s where I learned to differentiate T. nuttallii from the other two lower-elevation horsebrush species widespread in Utah, T. glabrata and T. spinosa. In some places all three species can be found growing together. T. nutallii’s peak flowering is later than T. spinosa’s but prior to T. glabrata’s. After I found a collectable population here on 6/18/2007, four of us came back 9 days later and worked several hours to complete the seed collection. 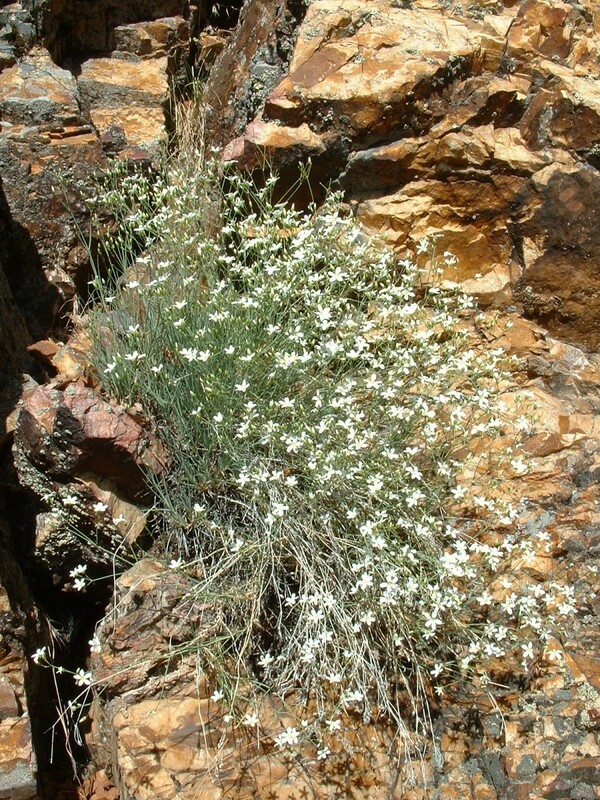 Here this grows around 5,600 ft elevation, among Eriogonum corymbosum, Gutierrezia sarothrae, Grayia spinosa, Linum puberulum, Castilleja chromosa, Glossopetalon spinescens, Tetraneuris acaulis var. arizonica, Opuntia polycantha, Juniperus osteosperma, Achnatherum hymenoides, and Artemisia sp. 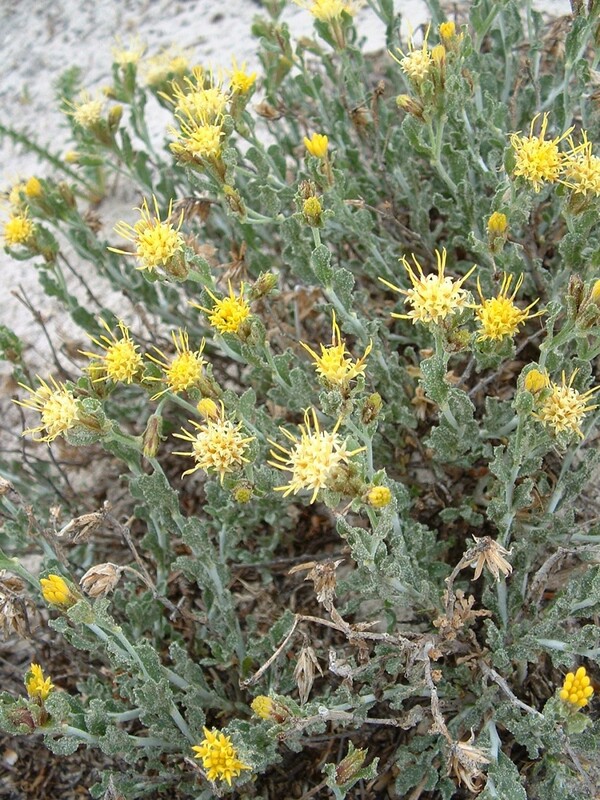 Here this grows around 5,100 ft elevation, among Eriogonum corymbosum, Gutierrezia sarothrae, Grayia spinosa, Ephedra torreyana, Pleuraphis jamesii, Castilleja chromosa, Opuntia polycantha, Cryptantha flava, Sclerocactus sp., and Artemisia sp. The San Rafael Swell area of east-central Utah is a place I have spent little time. The days I participated in seed collections of these two species there have constituted most of my time there, so far. Of the general categories of habitat across Utah, this one seems to have less infiltration of non-native plant species. It also seems to have a higher species diversity. These were here in a broad wet meadow at around 8,800 ft, among Pedicularis groenlandica (elephanthead lousewort, which can be seen in this photo’s background), Carex utriculata, Carex simulata, Caltha leptosepala, Potentilla gracilis, Hackelia floribunda, Aconitum columbianum, Veratrum californicum, Achillea millefolium, Carex aquatilis, Salix sp., Pinus contorta, and Populus tremuloides. 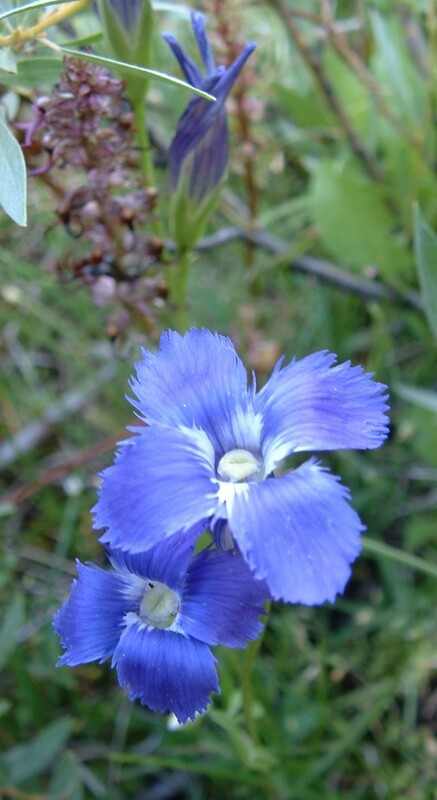 Here this grows in the same big meadow as the gentian immediately above. Greg and I were also hoping to collect seeds of Phacelia sericea near here, but we only found a few of those plants–not enough to consider trying to collect. Here these grow on a windswept broad ridgetop at around 10,300 ft elevation, among Artemisa frigida, Chrysothamnus viscidiflorus, Astragalus sp., Pseudotsuga menzeisii, and Abies concolor. I went with Greg when we photographed and collected vouchers in peak flower, and then he returned later with a friend to collect the seed. I stumbled onto these while aiming for Astragalus kentrophyta, but that species here lacked enough seed that season to try to collect. 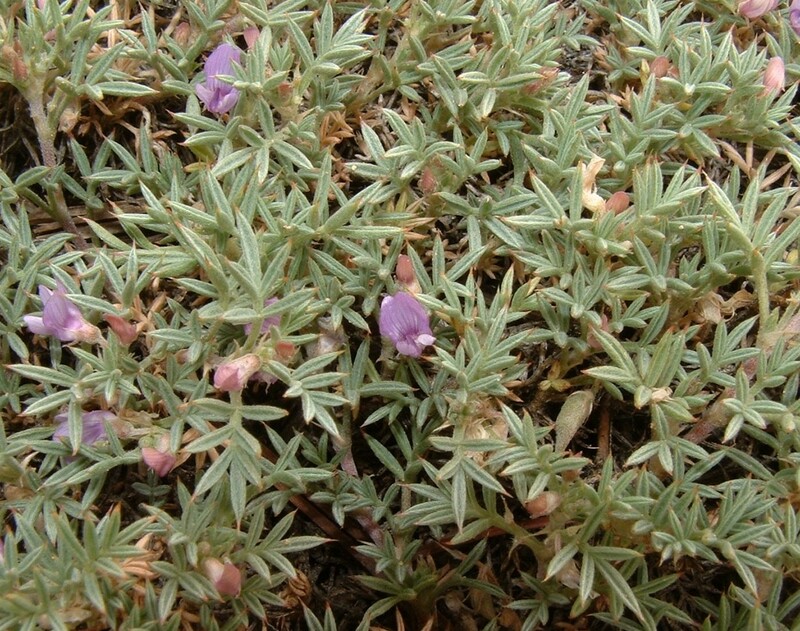 These O. parryi grow very plentifully around 10,200 ft elevation, among Ericameria discoidea, Cirsium eatonii, Monardella glauca, Artemisia ludoviciana/michauxiana, Astragalus kentrophyta, Mahonia repens, Swertia radiata, Penstemon sp., Lupinus sp., Salix sp., Ribes sp., Sedum sp., Picea engelmanni, Pinus flexilis, and Juniperus communis. 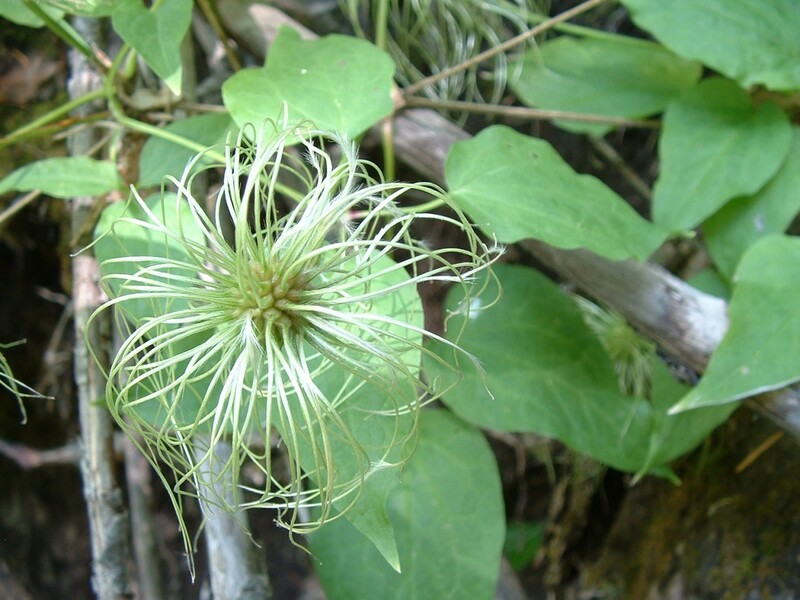 These are photos of plant species I learned to identify and first took decent photos of during 2007. 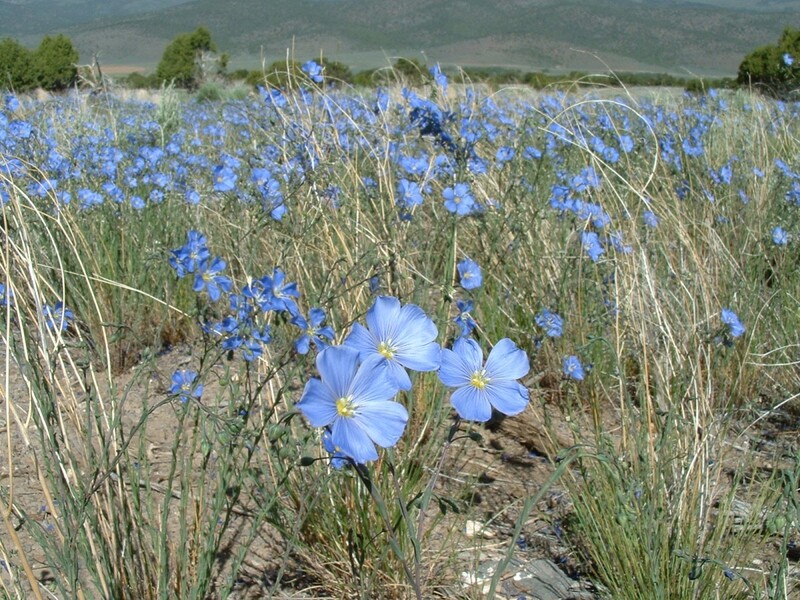 In this valley of about 7,000 ft elevation there were wide swaths of blooming blue flax like this. Associated species are big sagebrush, pinion, juniper, indian ricegrass, rubber rabbitbrush. This turned out to be an invasive. 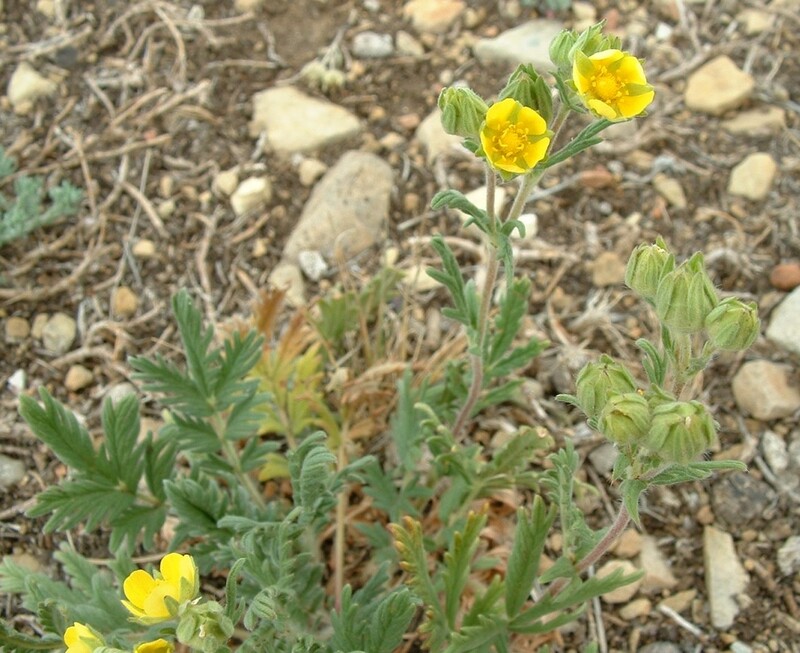 There are five species of this Euopean-native genus of mustard that occur now in Utah. 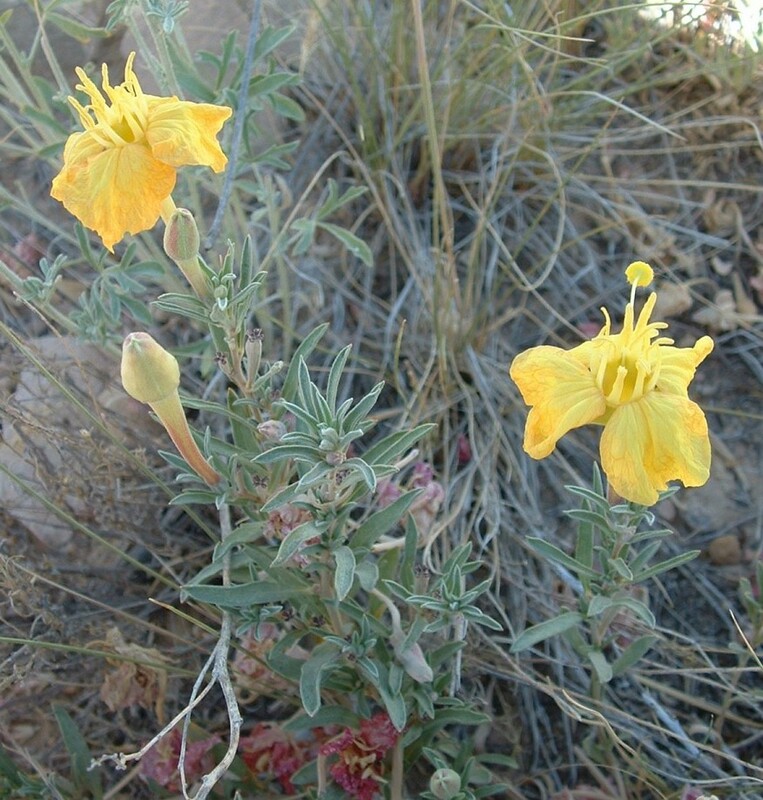 There are at least three species present in Salt Lake Co. The fairly high elevation of this “mountain brush” site, ~6,900 ft, tilts me toward assigning this species as “alyssoides,” but I’m not certain. 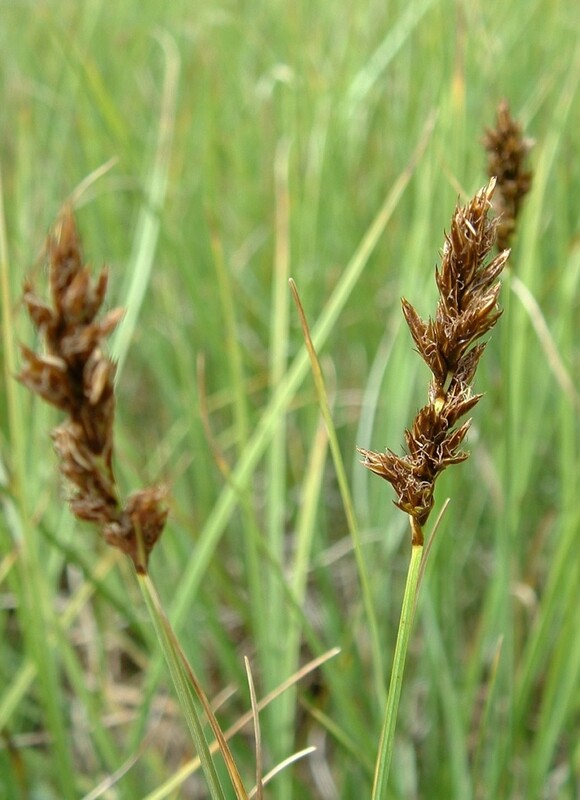 In the photo you can also see the Bromus grass there; most plants of that genus that occur in Utah are also non-native. This grows here at about 6,800 ft elevation, among associated species Alium sp., Gutierrezia sarothrae, Pinus edulis, Juniperus osteosperma, Quercus gambelii, Artemesia tridentata, Eriogonum brevicaule, Cercocarpus ledifolius, Opuntia sp., Echinocereus triglochidiatus. 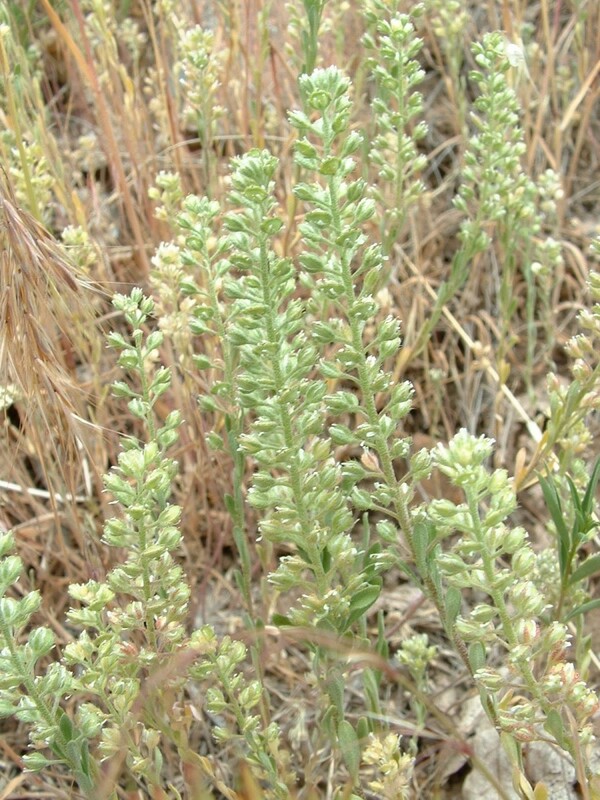 Had never seen this species in the field before, and might not have recognized it had there not been a couple of blossoms left to distinguish it from sagebrush (Artemesia). Most blossoms were gone by this time, mid-June. 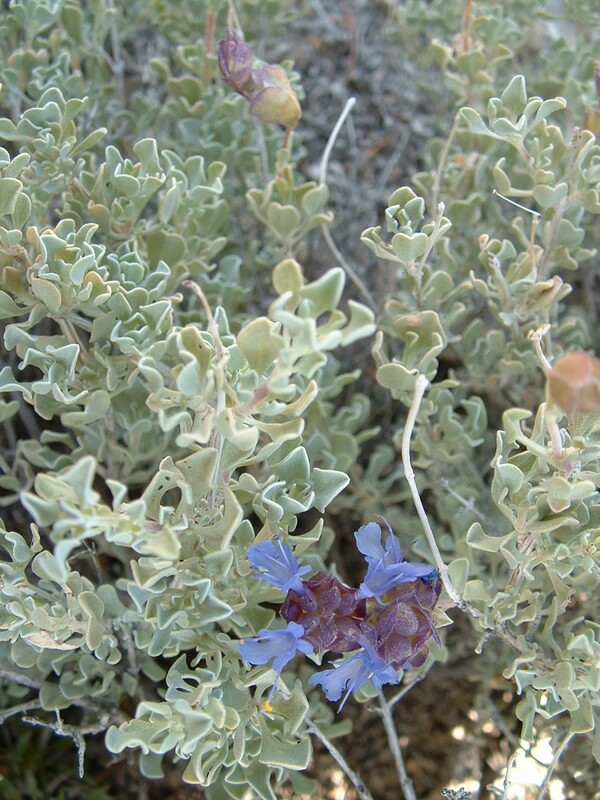 After learning the look of this foliage, I have found it growing in a couple of other ranges farther to the south in SW Utah–the Antelope Range and the Beaver Dam Mtns. 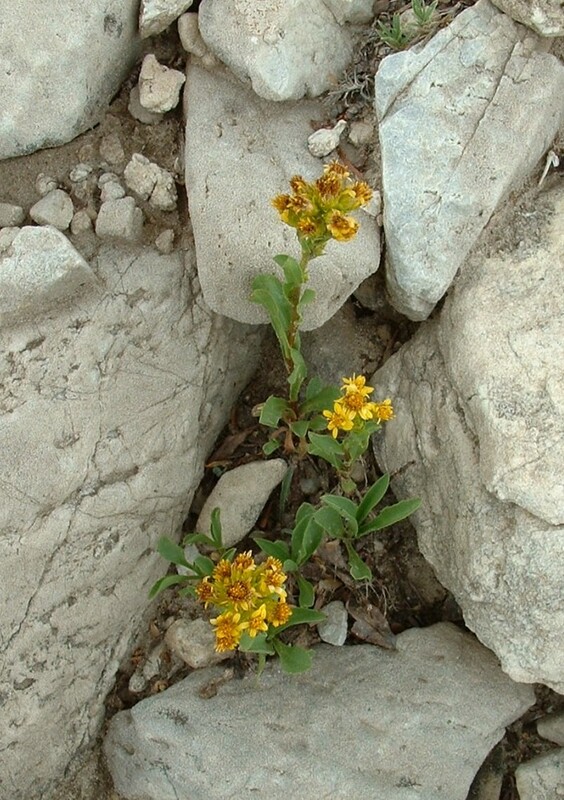 In those places, it grows at elevations more than 1,000 ft lower than the ~6,900 ft where it was here in the House. Each place I have seen this, it has seemed to be in a very narrow elevation window, although where that window lies varies pretty widely in different mtn ranges. This was parasitizing big sagebrush, Artemesia tridentata, growing near the bottom of a limestoney canyon. Mid-June was late for this species’ blooming. Most of these plants with blooms were farther along than this one. 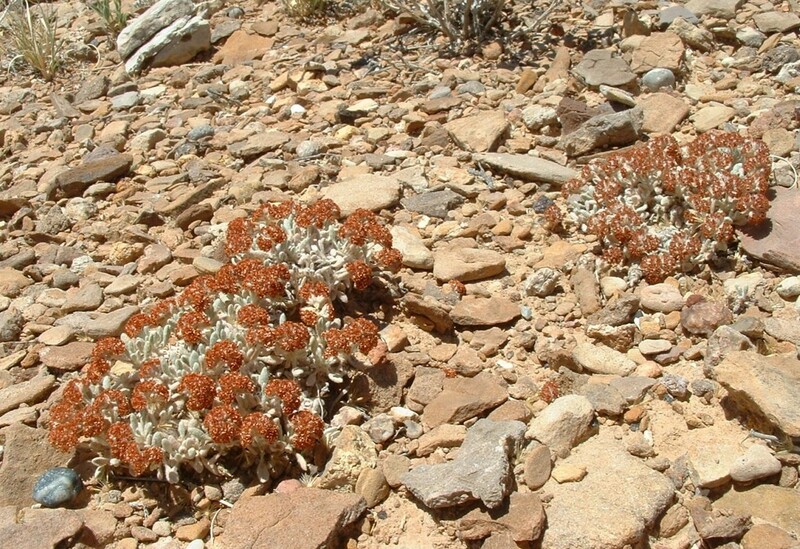 These were growing around 6,900 ft, among Physaria chambersii, Eriogonum microthecum var. laxiflorum, pinion, juniper and a cryptanth and several aster species. Reptiles species I have seen (or found shed skin from) near here have been sagebrush lizard (Sceloporus graciosus), western fence lizard (Sceloporus occidentalis), great basin collared lizard (Crotaphytus bicinctores), great basin rattler (lutosus), great basin gophersnake (Pituophis catenifer deserticola) and striped whipsnake (Masticophis taeniatus taeniatus). This was growing at about 7,500 ft elevation, interspersed with Eriogonum heracleoides, and near lupine, aspen, Hackelia sp., serviceberry, snowberry, oregon grape. 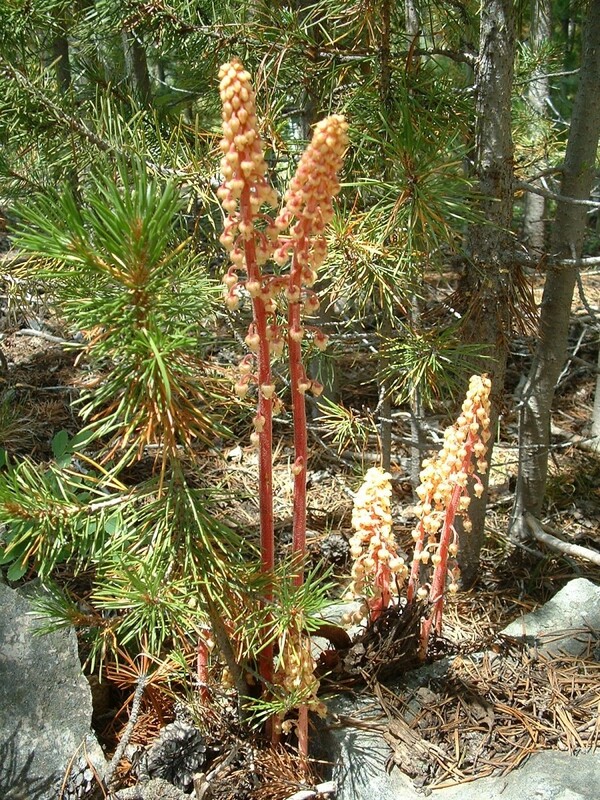 This parasitic plant can grow on ponderosa pine roots, but here on the Uintas’ north slope it was instead using lodgepole pine as its host. I regret not obtaining a photo in better focus. As part of the Seeds of Success fieldwork, we found this while searching unsuccessfully for enough Astragalus kentrophyta to collect seeds from, at almost 10,000 ft elevation along a N-facing talus slope. It was more abundant than the A. kentrophyta, here. This was growing on a plateau at very high elevation, above the conifers. 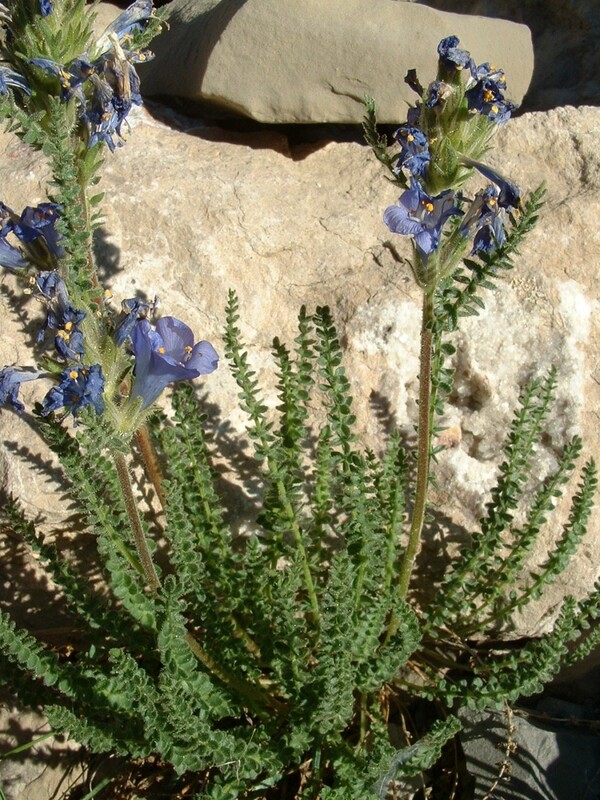 This grows up around 10,000 ft elevation, near Astragalus kentrophyta, Monardella glauca, mountain deathcamas, very-low-growing willow, limber pine and creeping juniper. 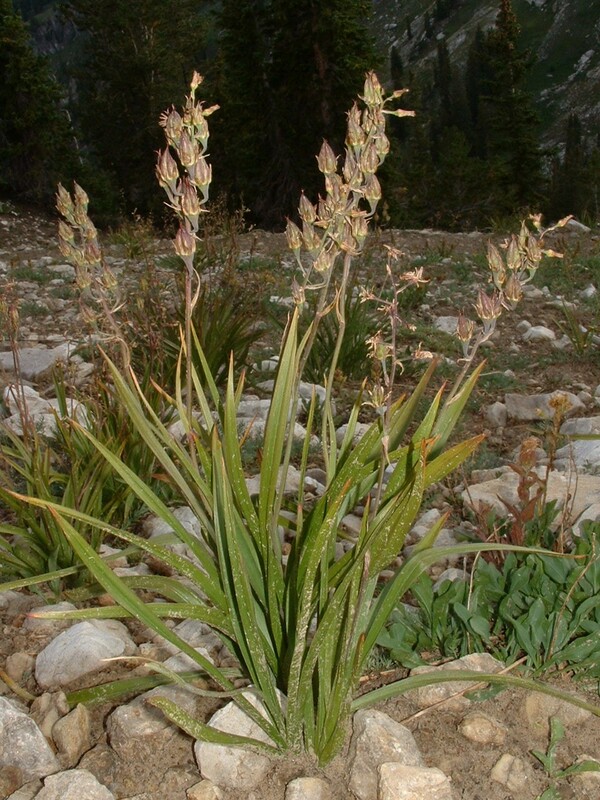 This species is fairly similar to the foothill deathcamas (Zigadenus paniculatus), but was growing here around 10,000 ft elevation–4,500+ ft higher than you can find the foothill species (Z. paniculatus) in the nearby Oquirrh Mtns. The formal name for this “stinking horesmint” was apparently recently changed from the old “Monardella odoratissima.” Here it grows in an elevation window with about 9,000 ft as the low end. This keeps blooming–as old flowers ripen to seed, new flowers continue to be produced. I had seen the bright orange blooms of this species here once, years before. This mountain range seems to hold a very broad plant species diversity. 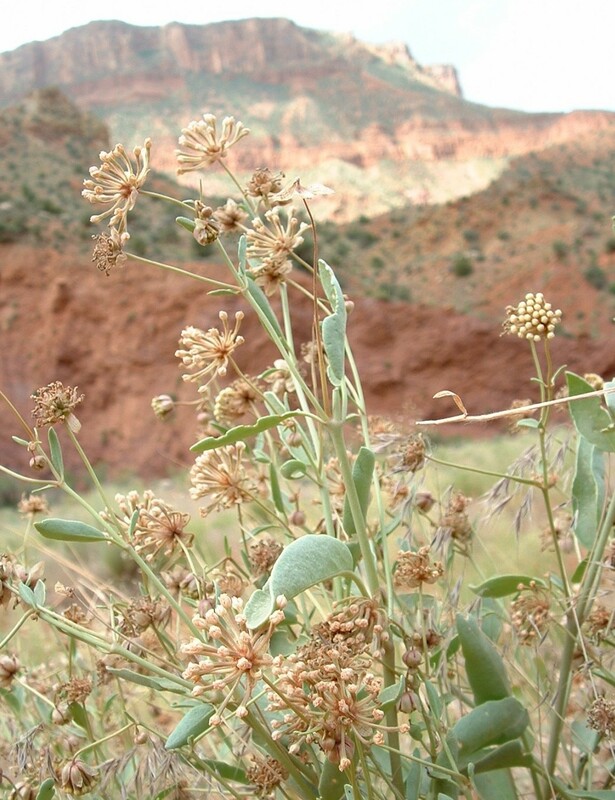 This butterfly milkweed grows around 5,200 ft in pinion-juniper habitat, near whipples cholla, palmers penstemon, skunkbush sumac, apache plume, curlleaf mahogany, big sagebrush, snakeweed. 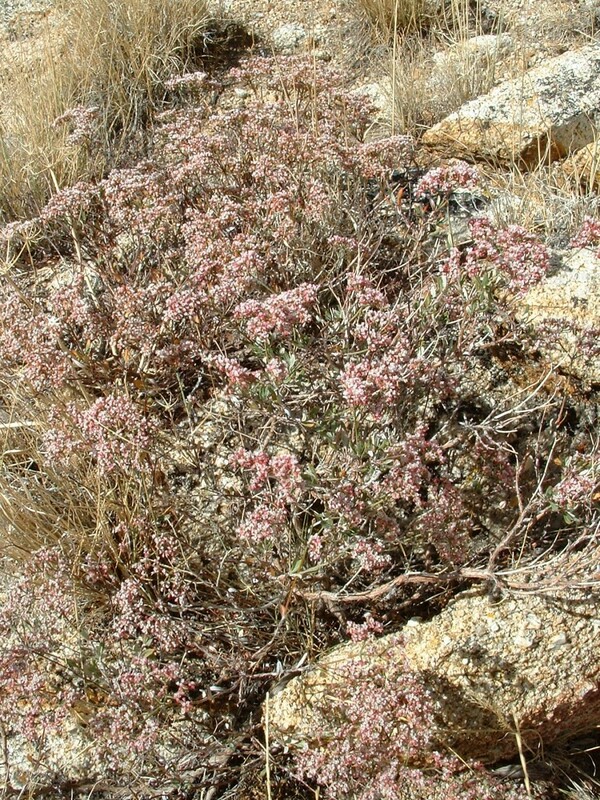 I’ve seen this species of buckwheat in several other western Utah ranges. 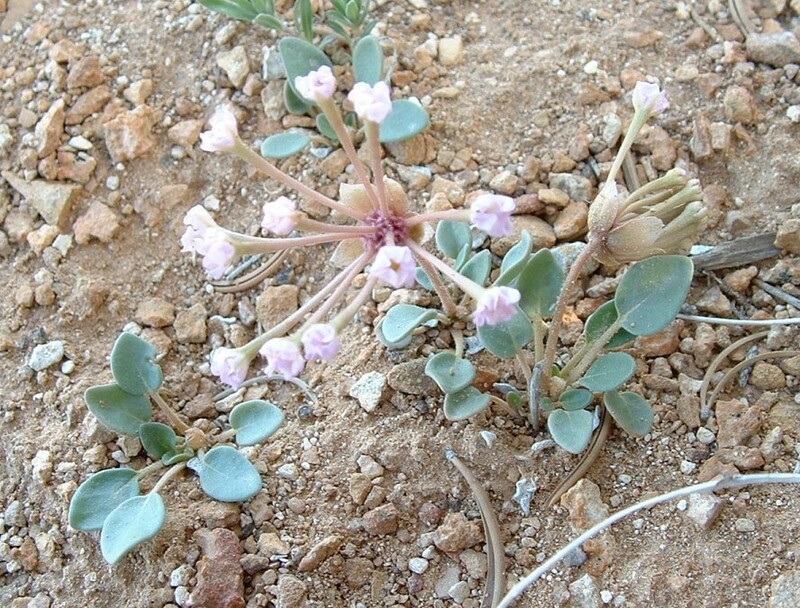 Sometimes, as here, pink-flowering (shown) and white-flowering plants of this species grow together. In all other places I’ve seen it, this taxon is smaller, lower and more scraggly, with fewer blossoms per plant than here in the Sheeprocks. Both this species and the other buckwheat below bloom late in the year. Here in 2007, mid-September was peak bloom time for both these buckwheat species. This buckwheat species grows among E. microthecum but has a broader elevation window of about 6,800-7,400 ft at this area in the Sheeprocks. Associated species near this photo at around 6,850 ft were Amelanchier sp., Penstemon humilis, Allium sp., Artemisia tridentata. 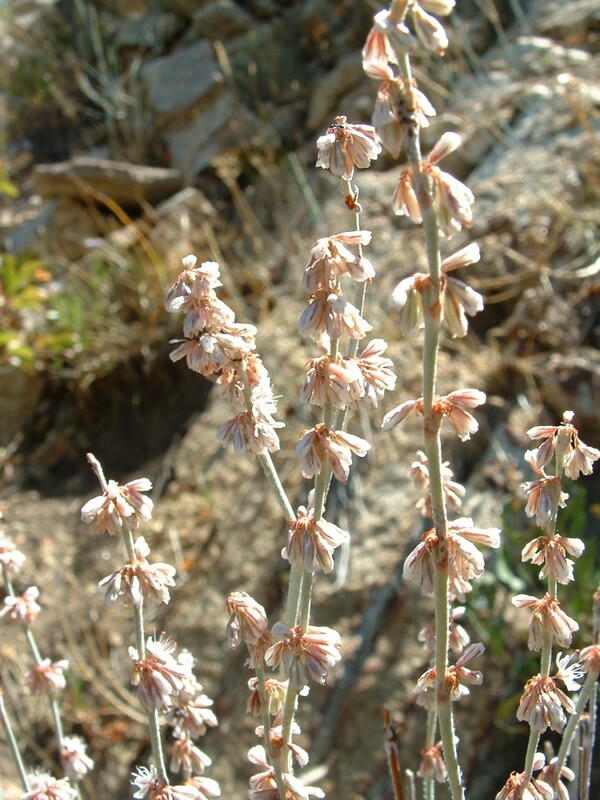 Quercus gambelii, and Eriogonum microthecum. 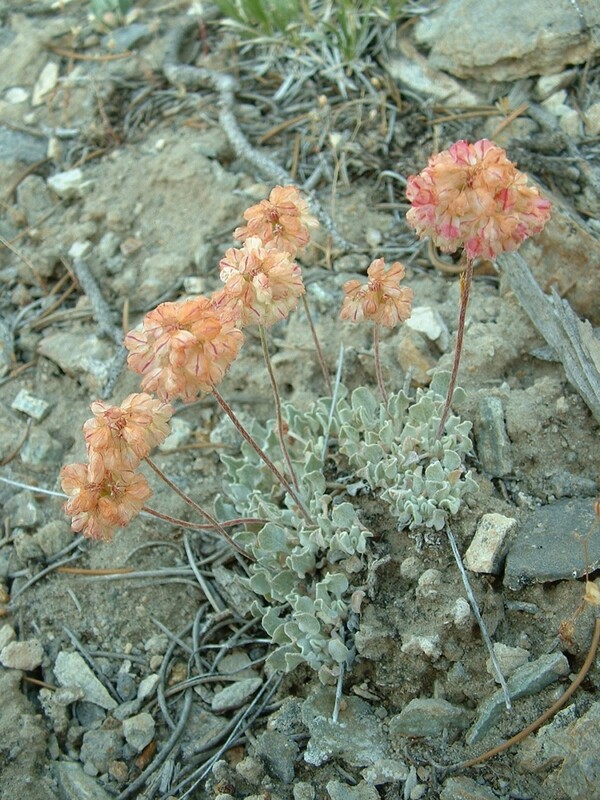 I look forward to someday being able to recognize all Utah’s Eriogonum species I come across. I might never attain that with willows, lupines, rabbitbrushes and milkvetches (Astragalus), groups that each contain similar species that strike me as very difficult to differentiate. 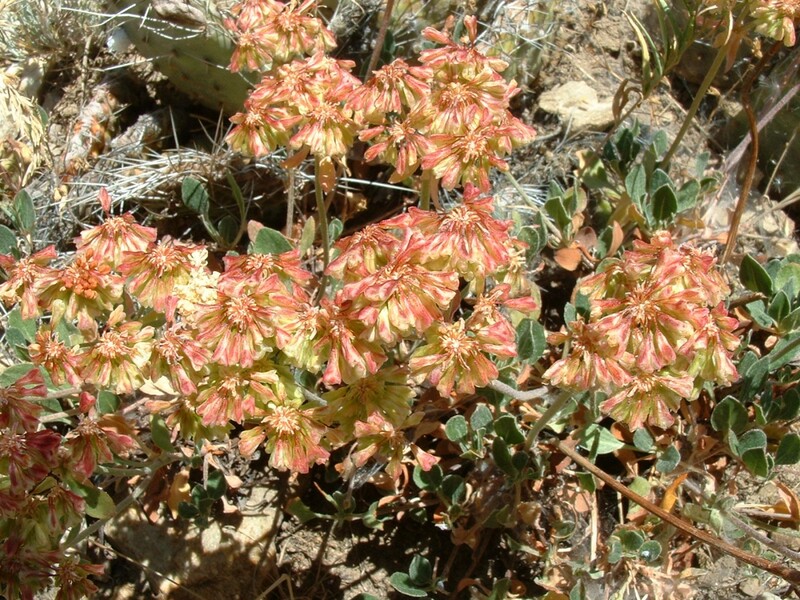 But I can foresee learning all of Utah’s Eriogonum and Penstemon species.